A Corriedale who wants to share! Our lovely Corriedale sheep has decided to share his wool with us! 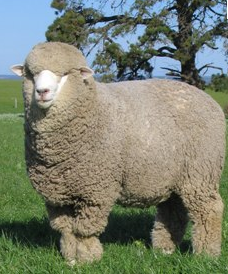 We are thrilled–we LOVE wool! After shearing, processing, and carding, the lovely wool was formed into the roving that Arabella shared with me on my birthday. We dyed the Corriedale in her high-tech dyeing center, and dried it outside on her drying frame (aka, trampoline). 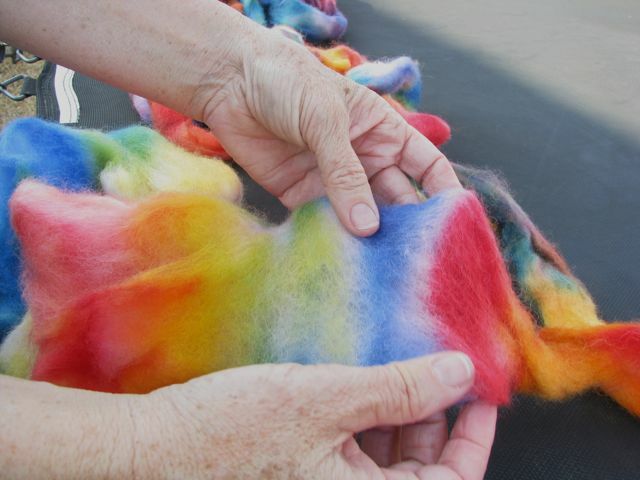 I took the dyed roving with me to my very first fiber retreat, Wildflower 2011, and happily spun it between workshops, which were all about color this year. I have discovered that dyeing wool is a creative process within a creative process, because the spun wool can look so different than the dyed roving–it is it’s own creativity! Arabella suggested that I ply this yarn with a thread, choosing one of the colors I wanted to bring out. Plying the yarn with thread gives me more final yardage of the wool, because otherwise I would ply the wool upon itself, and get half as much to knit with. So I choose a lovely teal thread from the fabric store. I can’t wait to see how it turns out! As I come to the end of the marvelous green bump that MonChere brought me on Mother’s Day, I have tangible evidence of the truth of Arabella’s statement. 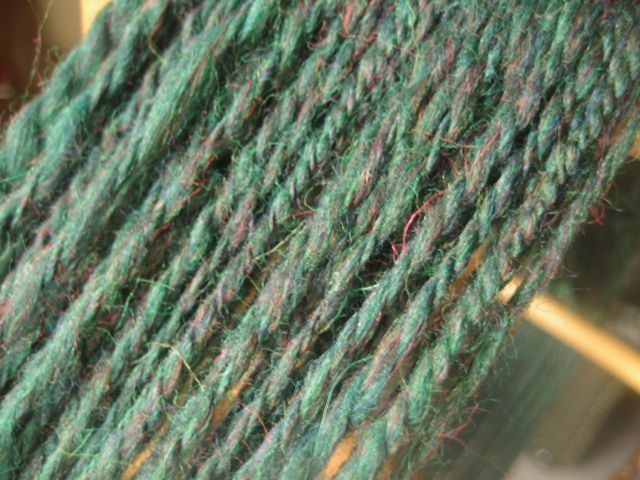 The green bump (that’s what a large roll of roving is called) spun into about 9 skeins. Oh, the difference between the first skein and the last! In this first skein, notice the uneven strands–some are “skinny” and some are “fat.” This occurs when the spinning of the singles is uneven–of course, the hallmark of a beginner! This is one of the skills that can only be gained by “time at the wheel.” Spinning such a large bump of wool gave me enough time at the wheel to really improve on my consistency. Another issue for beginners is “overspinning,” which is also a consistency issue. It happens when too much twist is added to the single during spinning. 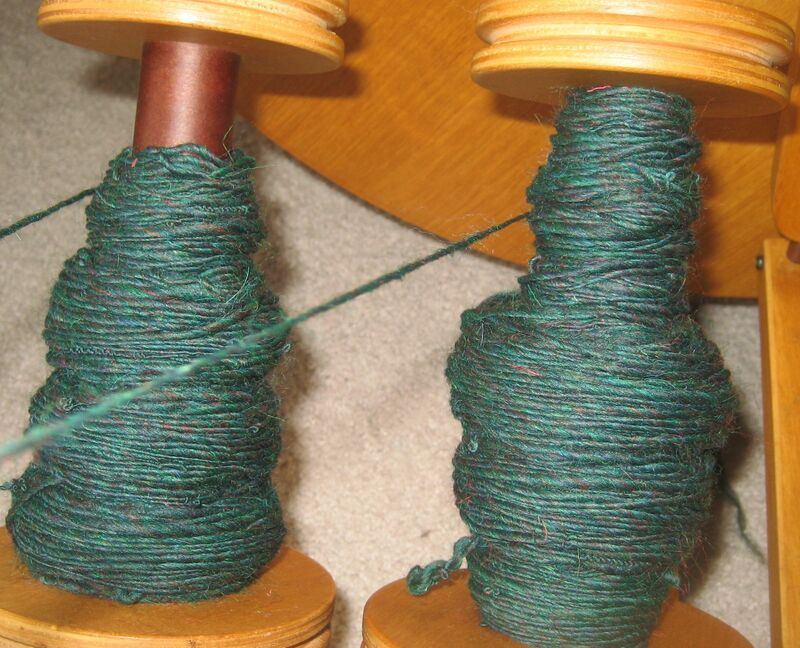 When plying two singles, spinning in the opposite direction from which the singles were originally spun “balances” the finished yarn as they are twined together–except when both singles are inconsistently overspun. Then you just get what’s pictured here–evidence that this spinner needs more time at the wheel! It does happen, though. The improvement does happen. 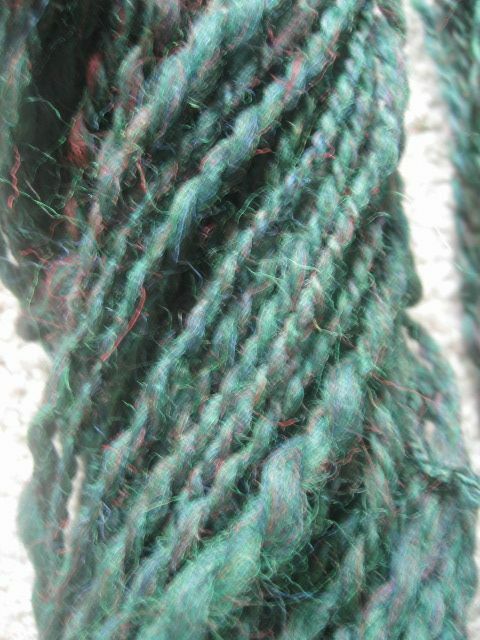 Compare this last skein (hooray!) with the first above. Notice the evenness of the strands compared to each other, and the evenness of the whole skein compared to the first. 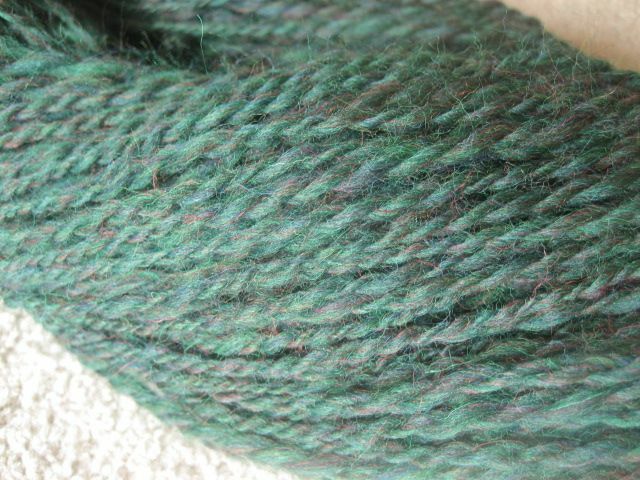 This last skein even felt completely different in my hands as I wound it–lighter, fluffier, balanced. As for the improvement, I can’t tell you what to do specifically, except keep spinning. It’s very strange, really. A spinner begins as an uncoordinated, goofy, stumbling upon oneself, uncertain being, but sticking with it, somehow she manages to bring it all together by not thinking about it, but simply doing it. Time at the wheel, says wise Arabella. Who is Kate and Why is She Lazy? Lazy kates come in all shapes and sizes, depending on the brand. 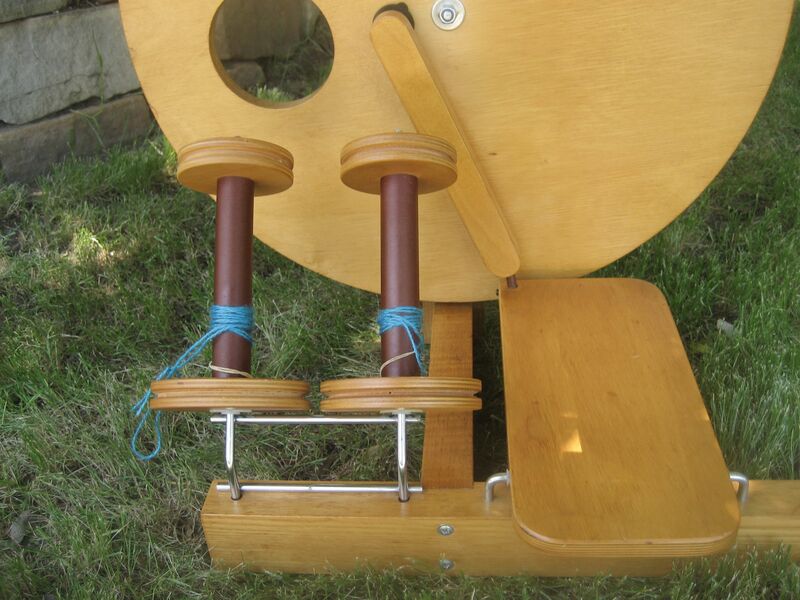 Many spinners make their own lazy kates from dowels and plywood. The lazy kate is simply a way to store bobbins holding spun yarn, or to help in plying the yarn. These lines are the oldest references (1809) I can find to Lazy Kate–though it might be just that the rhyming of the vowel sounds in “lazy” and “kate” are all that was needed to create this persona–poor Kate! If any of you spinners out there know any other history of how Kate came to be so lazy, let us know! When I had finally spun some yarn I was proud of and discovered I was only halfway through the process, I was a bit alarmed. Darn it! Watching the spinners in my Wednesday class left me feeling that plying might be harder than spinning. More twist to control, more yarn to feed, and all while treadling in the opposite direction (that is, if I could remember to!) But, like spinning itself, we seem to know what to do with this action called plying. In time, the brain and hands coordinate, and we are plying away. 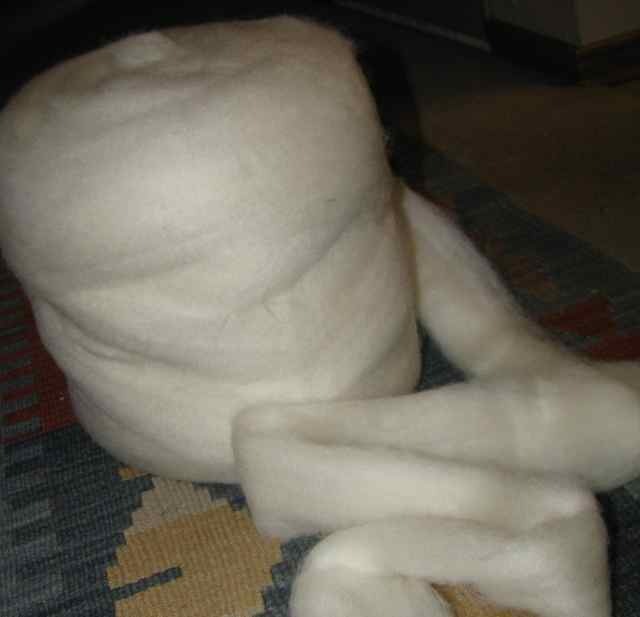 the wool fibers together into a stronger, now usable, strand. Singles are most often used in weaving, but rarely in knitting. Once you’ve spun two bobbins of singles, you can ply them from a lazy kate onto a third bobbin. The important thing about all this is that you must ply in the opposite direction from which you have spun the singles. This is because the act of plying the singles in the opposite direction from which they’ve been spun “balances” the twist between the two singles. 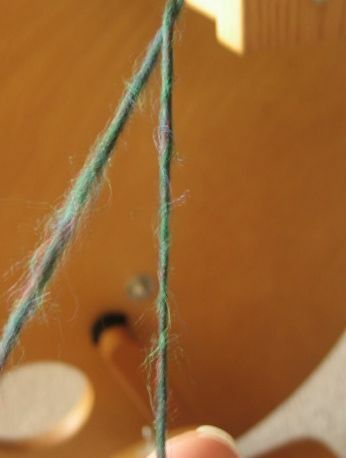 Plying in the same direction will just “undo” the twist and give you less stable yarn. Lastly, you must ply singles that have been spun in the same twist direction! 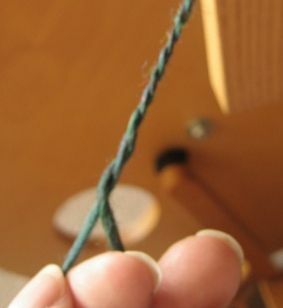 Plying a Z-twist strand with an S-twist strand will just give you a big mess! Arabella advised me to spin all my singles with my wheel spinning clockwise (Z-twist). 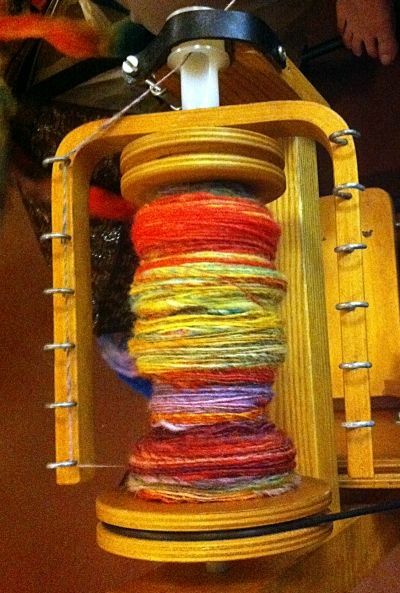 With this as the only standard for my singles, I can ply away without undoing the twist, or creating a mess!